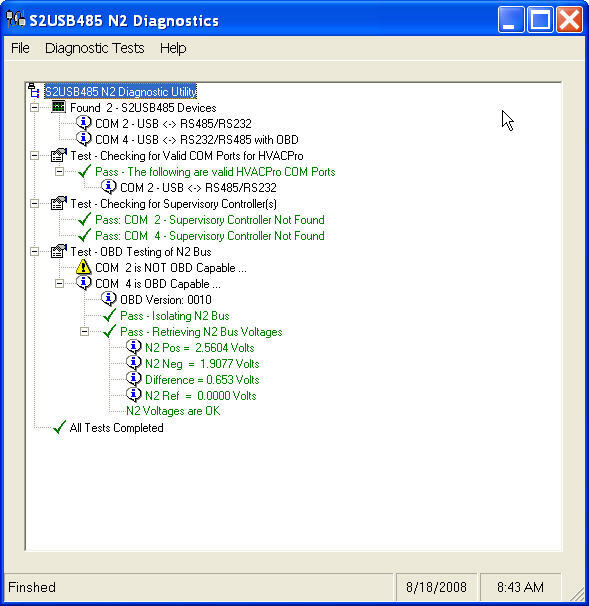 S2USB485DiagN2 is a Windows application that uses our S2USB485 device to perform basic diagnostic tests on your computer and N2 bus. Effectively you can use this software with our S2USB485 device as a N2 Bus Tester. This application is Free to our S2USB485 customers. This is an interim fix to a bug within the Windows installer, where Windows constantly tries to reconfigure S2USB485Diagn2 when you run it. To use this version, uninstall the any previous version via Control-Panel - > Add/remove Programs and then install this version. Also, due to a Microsoft Update bug, you may need to completely uninstall your current S2USB485 Drivers before you will be able to install the latest drivers. Checks for Supervisory controllers on the N2 bus(es) which causes problems for JCI's HVACPro and JCI's FX CommPro applications. With OBD capable S2USB485 devices (devices purchased after July 1, 2008), N2 Bus voltages are measured and displayed. Voltages that are out of range are indicated and possible faults are given. Ver 1.4.3 and .4 (current version) adds reporting capability for documentation purposes. Ver 1.5.x (to be released later this year) will include N2 bus scanning and reporting functionality.